Gotta love a little Ron Burgundy. I was being business-y in Seattle this week and was luck enough to stay a mere block from Pike Place Market. Oh goodness, you can bury me there, so long as you cover me in briny oysters. Heaven. 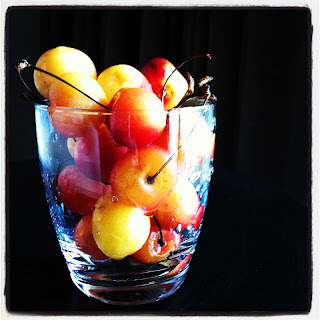 Picked up a pound of Rainier cherries in between projects. Unbelievably delicious. I may have been tempted to move there and solely subsist on salmon and stone fruits. Did I just invent a new fad diet? More recipes to come soon... still getting caught up on my real life after a crazy work life the past week. Thanks for still being my friend.